New casino games at Dealers Casino - Try them today! Become familiar with the best new online casino slot games at Dealers Casino. The slot machine was invented in 1891 and has developed to become an essential part of any physical or online casino. Slot machines are one of the most popular online gambling methods. These are casino games where players spin a series of wheels hoping to get the perfect combination of symbols for the jackpot pay-out. You press the button to get the slot machine to start spinning. When it stops it has created a combination – different combinations lead to different pay-outs. Some of our more popular games offer extra spins to get you started. Want to learn more about slot machines and which games offer extra spins? – Read more on our Ultimate guide to Online Slots. Want to learn more about our top 5 video slots? You can find more information about each of these and other popular casino games as well as their RTP (Return To Player) and opportunities for extra spins here. Space awaits you in this new ISB-Booming video slot game. With three special features to keep you entertained this game offers fascinating animations with fun symbols. The slot machine game is built up by 5 reels and 3 rows, it has a return to player of 95.13% and is of medium volatility. The three different features all are triggered by the special symbols of the game. The first is a 2-Way Pay, that wherever it falls on the gameboard activates payment from both right to left and left to right on the following 10 spins. The second feature is stacked wilds, this happens when either a hole row is filled with Wild symbols or a whole reel. 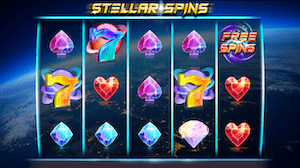 The last special feature of this space inspired video slot is the Free Spins. This feature is triggered when 3 scatters appear on any reel. This triggers 8 Free Spins. Take a trip to Space – visit the Dealers Casino Lobby now to try it out. Meet the great magician who will transform your spins into wins in this ISB-Redrake game called Magic Wilds. The video slot game has a return to player of 95.3% and is of medium volatility. This new slot game that you will find in the Dealers Casino lobby includes special features. In the Free Spin Bonus Feature the geometry of the game will develop from a 5×4 Reel game with 32 paylines to a 5×8 Reel game with 100 paylines. Become enchanted and visit our lobby now to play this game. Together with the slot machine character John Hunter you can explore Da Vinci’s Treasures. ISB-Pragmatics new game is now available in the Dealers Casino Lobby, with a return to player of 96.53%. The game has 3 rows, 5 reels, and 25 pay lines. Da Vinci Treasures includes Wild symbols and Bonus symbols. The Wild symbols substitutes for all symbols except the Bonus. If you manage to spin 3 Bonus symbols it triggers 1 out of 3 random bonus games. Begin your search for Da Vinci Treasures – visit our Dealers Casino Lobby now. You can now find Maximus Payus, the new game from NYX-Inspired in the Dealers Casino Lobby. 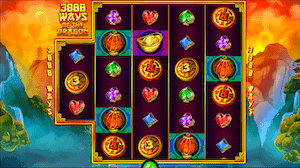 The video slot consists of a 5×4 game board with 1024 ways to win. The game has an RTP of 95%. As is custom, this game also includes several special features that players can look forward to. One of these features requires the player to spin 3 or more bonus symbols, once achieved extra spins are awarded. During these extra spins wild symbols act as multipliers. Visit the Dealers Casino lobby today to play Maximus Payus. 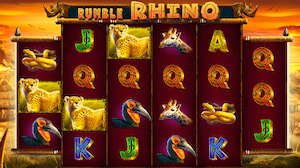 ISB-PariPlay and Save the Rhino international (SRI) have come together to create this not only entertaining but also charitable slot machine game. 10% of all the profits made by the game developer are donated to saving endangered rhinos. This game has a return to player of 95.52%, it includes symbols such as wilds, and bonuses. The game consists of four main reels and two smaller reels on each side where the different bonus symbols can appear. Play this entertaining game and help save the Rhinos at the same time – visit our Dealers Casino Lobby now. Dealers Casino has added the new NYX-Inspired game Grand National Slot to their repertoire. This game has a return to player of 95% and is constructed out of 5 reels and 4 rows. The game can trigger extra spins by spinning three or more bonus symbols. During these extra spins the Wilds stack in blocks of four and step down one space with each spin. The final special of this video slot game is the Mystery Wins. These are Question mark symbols that appear at any point and uncover stacked symbols that often lead to winning combinations. Test Grand National Slot in our Dealers Casino Lobby today. 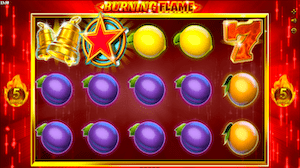 Dealers Casino wants to welcome the new game from iSoftBet-GameArt, Burning Flame, to its expanding portfolio of online slot machines. This game has an RTP of 96.4% and is of very high volatility. This game is unfortunately not available for UK players. 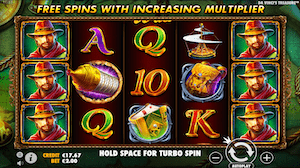 To entertain its players this slot machine game offers two special features. The first feature occurs when three or more Scatter symbols are spun. This triggers 10 in-game Free Spins. If during these Free Spins 3 or more new Scatter symbols are spun the bonus feature will be retriggered. The second special feature is the Expand & Split Feature, during which any symbol will expand triggered by a Scatter symbol. The expanded symbol will occupy all positions on the same reel but does not replace the symbols already there. Visit our Lobby to play Burning Flame now! Microgaming-2by2’s new online slot “Medusas Golden Gaze” is now available on Dealers Casino. This game has an RTP of 96.06% and is built up by 5-Reels, 3-Rows and 15 pay lines. Inspired by the Greek legend of Medusa its symbols reflects these ancient times. The casino game includes two special features. The first is a Reel Copy Feature, which appears when one reel contains a full stack of the same symbol, this stack is then copied to the 1,2,3, or 4 remaining reels. The second Feature is a Free Spin Bonus Feature. For this feature to be triggered 3, 4, or 5 bonus symbols have to be spun. Depending on the amount of bonus symbols spun, you will be rewarded with different amounts of in-game extra spins. Stare into Medusas Golden Gaze by visiting our Games Lobby today! Good Feathers is the latest game by NYX-Blueprint and is now available in our Dealers Casino lobby. This game takes you back to the 1950’s Chicago where the gangster “Birds” are in control of the city. This game has an RTP of 96.32% and is of medium volatility. 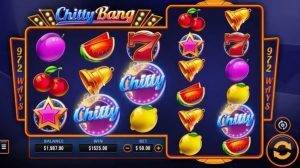 Not only are the graphics and animations of this game superb, it also includes three different features to entertain all types of slot machine players. These features include cascading symbols, Wilds and multipliers. Make sure to have an Egg-cellent time with these Chicago Birds, by playing Good Feathers now. 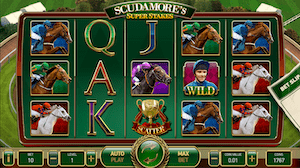 In NetEnt latest game – Scudamores Super Stakes, players are taken to a horse racing track. This video slot game has a Return to Player of 96.11%. With five reels, three rows and 20 bet lines this game makes sure to keep you entertained. If you manage to spin three scatter symbols Peter’s Classic Cup is triggered where the game expands into a five-reel, four row and 32 bet line game. Not only is the play field expanded, players also get to choose their favourite horse and can win up to 5.000x the bet. Visit Scudamores Super Stakes – go to our lobby now. 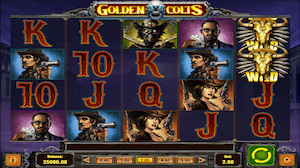 ISB – Pariplay has in this online slot machine game perfected the classic with its graphics and soundtrack. The game offers its players a Return to Player of 96%. With features such as Sticky Re-Spin Wilds and Giant Reel Re-Spin, this video slot provides 972 ways to win. Visit our lobby now to play Chitty Bang. The Swedish game developer Play’n Go welcomes you to its new game – Golden Colts. With animation, graphics and sound effects, this developer has done everything to make this game as reminiscent of the Wild West as possible. Moreover, it has a Return to Player of 94.57%. The game includes two special symbols: The Wild Bull, which substitutes for any other symbol except the scatter, and the Scatter (Golden Colt Box) which can unlock a bonus round. The Wild Bull does not only substitute other symbols, but it is also the symbol with the highest value. Spinning three or more of the Wilds can increase your payline between 20x and 250x. Spin three Scatter symbols and unlock the Bonus Round. During this round a spinning barrel appears which will stop at any of the seven bullet holes triggering a bonus prize. Visit our Dealers Casino Lobby now to find out how you can play Golden colts. Give iSofBets newest addition to our game library a try. 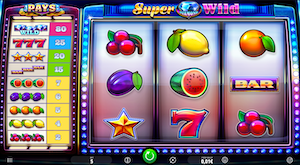 The Super Diamond Wild slot machine game is a medium volatility game with an RTP of 95,66%. It is a classic 3-reel 5-line game reminiscent of old school one-armed bandits. This slot machine has entertaining game features such as: When two reels are stacked but no wins are present the third reel will re-spin in search of a winning combination. Manage to stack all three reels with the same symbol and a Bonus Wheel will appear giving you the chance to multiply your winnings with anything from 2x-10x. Additionally, the one special symbol of the game, a Wild Diamond, will substitute for any other symbol to form winning combinations. Visit the Dealers Casino Lobby now to play this Super Diamond Wild. Visit a new realm in NetEnt’s new game – Golden Grimoire. With 12 different symbols this 5-reel 4-row video slot offers the players a Return to Player (RTP) of 96.44%. Four of the twelve symbols are special symbols that have an effect on the game. The Mystery symbol, Wild, Scatter and Sticky Mystery symbol are all important features of this newly released game. The Mystery symbol will only appear in the main game – it will transform other symbols from the leftmost symbol in the same row. The Sticky Mystery Symbol appears when players have managed to spin three Scatter symbols. This symbol acts as the Mystery symbol as in it transforms other symbols giving the player chances to spin wins. Play this newly released game by visiting the lobby now. This medium volatility game by Microgaming has a Return to Player (RTP) of 96.02%. It includes Wild symbols and Scatter symbols all in the Japanese inspired theme. The game is built up by four reels and includes two separate game features. The four reels equals 81 ways to win. To activate the first feature called “Reel Split Re-Spin” the player needs to spin four consecutive wins. When this happens the 2nd and 3rd reel splits and become a fifth reel. All the other reels will then stay the same while the middle reel spins and hopefully creates a win. The second feature is called the “Extra Spin Feature”. For this to be activated the player will have to spin 3 or more 4 Extra Spin symbols. During the Extra Spin Feature the middle reel is a stacked wild containing 3 locked Wild Symbols. When the game expands to 5 reels the chances to win increase to a total of 243 ways. Join us in the Lobby to explore this brand-new game right here. ISoftBet’s latest game consist of a 5-reel playing field with 50 ways to win. This video-slot game has an RTP of 95.22% and has a high volatility. The game consists of 11 normal symbols and 6 special symbols. The special symbols are the Wild, the Fortune diamond and the 4 different multipliers. The Multipliers will appear on every spin and multiply any win. If 2 or more of the Fortune Diamond symbols are spun Extra Spins will be triggered. During the in-game extra spin any wins will be multiplied by any of the 4 different multiplier symbols. 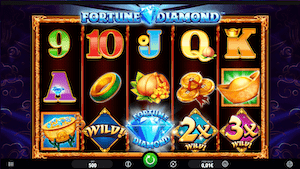 Visit the Dealers Casino Lobby now to Play Fortune Diamond. This video slot game from Red Rake Gaming comes with a Return to player of 95.5%. The slot machine is designed with five reels and three rows. There is the possibility to add an extra sixth reel. 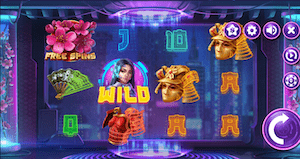 Additionally, the game offers a Scatter Wild symbol that can offer in game Bonus Spins if 3-6 of these symbols appear. 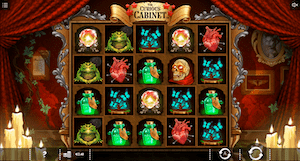 Visit the Curious CabinetTM from ISB-1×2 Gaming. With its 96% RTP, this slot machine is a game that surely will entertain as much as it scares. This high-volatility game invites you into an antique dresser with symbols such as Human Hearts or Sinister Doll symbols. If you spin drawers you are in luck as these can reveal hidden gems such as: direct monetary prizes, high-paying monsters and even Re-spins. Take a peek into the cabinet – visit our lobby now. The newest game from NYX-Scientific: AFTERSHOCK. The game is built with 3-reels and 5 lines and has an RTP of 96.06%. This simple looking game includes Wild symbols and an AFTERSHOCK feature. This latter feature can include a Shocking Wild that is activated if any double or triple aftershocks land on or within one position of the centre pay-line. Visit the lobby to feel the aftershock now! 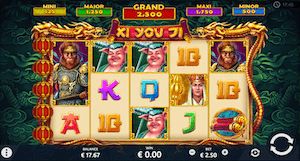 ISB-Pariplay welcomes you to Xi You Ji, a slot game based on a Chinese novel from the 16th century. This medium volatility game has an RTP of 95.95%. The slot game is built up by five spinning reels with 12 symbols and three special features. The special features include The Lantern Bonus where the player is awarded with sticky wilds, in-game bonus spins, cash prizes and a chance to spin the jackpot reel. The Jackpot Wheel is another of the special features which lets you spin a wheel and gives you the opportunity to win one of five jackpots. The final feature is The Sacred Journey, here the player chooses his own way through the grid to collect multipliers. Play Xi You Ji – visit the lobby today! Join iSoftBet in their new jungle game Jumbo Stampede! With entertaining graphics, this 6-reel game offers you 4096 ways to win. The game has a Return to player (RTP) of 95.94%. 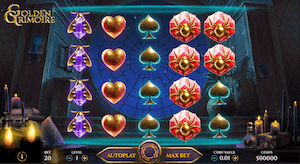 This game includes features such as in game extra spins, wild symbols and Jumbo symbols. The wild symbols can substitute other symbols to form winning combinations and will during the in-game extra-spins work as multipliers. Collect Bonus scatter symbols to be awarded the in-game extra spins, and during these, use the Jumbo symbols to win on non-adjacent reels. Choose Jungle Stampede directly in our Games Lobby! 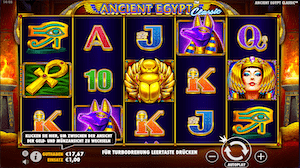 The Classic Pragmatic Play video slot – Ancient Egypt Classic is now available in our lobby. With 3 rows and 5 reels, this game offers an RTP of 96,47%. The slot game consists of 10 symbols including a scatter symbol, which can replace any other symbol to form a winning combination. Spin 3 scatter symbols and you will receive 10 extra spins. Enter this classic casino game through the lobby. 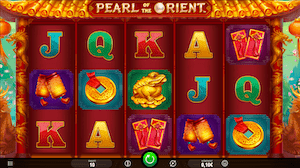 Now in the Dealers Casino lobby, iSoftBet latest slot game: Pearl of the Orient. With 5 reels and 10 winning lines this game has a Return to Player (RTP) of 96%. 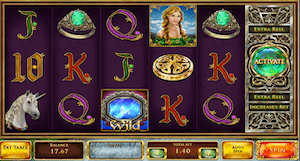 The online slot game offers 10 symbols plus one wild and one scatter symbol. Spin three or more scatter symbols to activate in-game extra spins. During this game mode the wilds, that always appear on reels 2,3 and 4 will not only expand as they do in the normal play but also upgrade the lowest value symbols to the next highest symbol. Visit the Dealers Casino lobby now to try out ISoftBet’s Pearl of the Orient online slot. 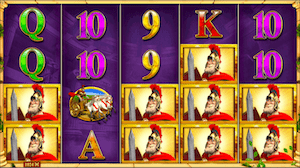 NYX’s video slot Rome: Rise of an Empire is inspired by the Roman empire and its gladiators. The game is a 20-line slot game with an RTP of 96.64%. Rise of the bonuses – Once the bonus wheel has been triggered you will be given the chance to enhance your balance through different symbols that will appear. Eye of the tiger – The tiger will randomly trigger 1 of the 5 reels on any spin. For the Glory of Rome – stake the minimum and watch the wild symbol substitute for any other symbol. Play Rome: Rise of an Empire by visiting our Games Lobby now! Pragmatic Play takes you on a Journey To The West in this 5-Reels, 3-Row game. This game’s fantastic graphics will let you follow the adventure of our Heroes whilst giving you a RTP of 96,47%. The bonus spin features occurs when Scatter hits. You will be rewarded with five bonus spins and if you manage to get three more Scatter symbols you will be rewarded with an additional three bonus spins. In other words, this game will impress you. Play Journey to the West by visiting our lobby now! The famous Leprechaun is back in this entertaining game from NYX. With a RTP of 96% this 5 reel, 5 row game. The game is perfect to play on either your smartphone, tablet or computer. With features like Wilds and four different types of bonuses this game suits everybody from the beginners to the advanced players. For players that are into Hi-stakes this game also features Big Bet Games where the return is higher. Visit the Lobby to play Rainbow Riches now! This wild game is presented by NYX. The goal of this game is to achieve a winning combination of symbols on the 25 lines (5-Reels, 5-Rows). Payouts depend on the number of coins deposited and the winning combination of symbols achieved. With an RTP of 96,7%. The game has four unique features including two wild-spins, a re-spin and the chance to release the Kraken! 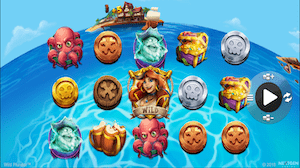 When the Kraken appears 1 or more symbols will be replaced by Wilds giving you an even more wild game! Release the Kraken now – visit the lobby to play Wild Plunder. Scientific Games Present – Hot Frootastic! This fruity slot is how a real fruity casino slot should be with 5 reels and 3 rows. In this game you only need to have 3,4 or 5 matching symbols on a line and you can win on one, multiple or all lines – giving you a RTP of 95.96%. This is an easy game for players that are looking for a authentic and great fruity casino slot, without having too much other nonsense. Visit our lobby now to test out Hot Frootastic now! 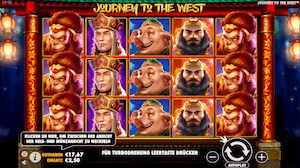 For this slotgame, iSoftBet invites you on a journey to the mythological parts of Asia. With a completely unique game set-up this 5-reel game gives you up to 3888 ways to win. The video slot includes 10 symbols + 2 special symbols (The wild and the bonus symbol). 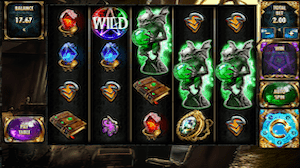 The wild will replace any symbol except bonus symbols to improve your chances of winning, while 3 bonus symbols or more will activate extra spins. On top of this, Dragon Spins are randomly triggered during normal or extra spins, dropping between 3 and 8 Wild symbols! This game will easily keep you entertained and with its 95.9% RTP and middle volatility it is a game for everyone! Are you ready to face the dragon? – Play Ways of the Dragon directly in the lobby! This game offers 5 reels with 20-win lines. A classic game set-up with an RTP of 95.3% and medium volatility makes it a perfect game for a beginner looking for a new game to keep them entertained. Players will occasionally be surprised by the different game variations like the Spinning Wild or Spinning symbol. In addition to this extra spin bonuses are available. Find Spin Dizzy in the games lobby and start playing now! This brand-new video slot from NetEnt games celebrates simplicity and takes us back to the golden era of Sci-Fi. With the 5-reels, 3-rows and 8 symbols you will be able to build robots to help you reach your optimal potential. This casino game has a stunning 96.01% RTP and medium volatility. The Wild-o-Tron 3000TM slot is a game that is both easy to understand and play. The game will keep you entertained with its wild-substitutions and stacked symbols. At the start of each game you will be able to activate the unique Wild-o-Tron feature that transforms up to 6 symbols into Wild symbols, the highest paying symbol in the entire game! Are you a Sci-Fi geek – Play our new Wild-o-Tron 3000TM game directly in the games lobby. Microgaming recently introduced this 5-reel video slot that includes Symbol-storage, Re-spins and Super-spins. The game’s layout is clean and easy to read, and what is best is that it offers its players various opportunities to win. When you first spin and get a win, these symbols are stored. Depending on what symbols are stored the higher your re-spin win can be. Three of the same symbols equals the Win Big Level! Play Icy Gems in the games lobby now! The Egyptian king Ramses is back! In this Oryx video slot your aim is to get a minimum of three of the same symbols on the active playing line. The more equal symbols, the higher the win! Ramses Book is a 5-reel, 3-row slot game. The game has 4 features that makes sure to keep you entertained. You can just play the classic version where you place a bet and then spin the reels. Ramses book offers a 96,15 % RTP! 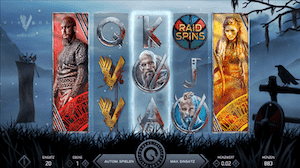 Based on the hit TV-show Vikings, this is one of the most highly anticipated NetEnt casino games of the year. With its 5-reels and 3 rows this game includes three exciting features: a Hotspot feature, Shield Wall feature and a Raid Spins symbol. In the Raid Spins feature reels and rows increases! With an RTP of 96.05 %, combined with the possibilities for extra spins, it is no wonder that this game is one of the most exciting games in our game-library. Raid like a real Viking – Check it out today!